Notes from Janey . . .
An exhalation, slow and disappointed, comes from behind. I don’t have to turn around to see who it is. I know it’s my long dead grandmother, Reta, watching me beating a pie crust into submission with her ancient wooden rolling pin. Why did she have to show up right when I’m obviously failing pie crust, her specialty? “And you claim to be my granddaughter,” she says, looking out at the muddy creek below the kitchen window, bloated from snow melting in the mountains. Like so many times before, my imagination has her dropping by to revisit her favorite place in the cabin that she and my grandfather, Malcolm, built in the late 1950’s. A spotless apron, freshly ironed, covers her good Sunday dress because my mother’s family, her daughter, was considered company. Silver hair waves past her ears but doesn’t make it to her shoulders. She stands as if her back is held upright by a wooden spoon. She glares at the mess being made in her dream kitchen, a domain that was once hers alone before it passed to my mother and then onto me. She tries to cross her arms over her massive bosom but they settle instead somewhere underneath, close to her small waist. I’m a child again, underfoot and failing to live up to her expectations. She looks at the hard-packed glob smashed like a cow pie over the worn spot on the counter. I follow her gaze to the platform nailed to the side of the pine made especially for him. It still holds the soggy remains of last week’s fermented muffins. Even the magpies are giving it a wide berth. She leans on the scratched and pitted porcelain sink that holds the last of the apples picked last fall from the tree that my grandfather planted over 60 years ago. In her day she was considered one of the best cooks in this Wyoming mountain community. She was a master at pies and a champion with flowers. And yet here I am in her kitchen, acting as if I have the right to be here. I brave a look in her direction. Confusion furrows her brows. I burst out laughing and a rare smile blushes her lips. I reach down to open the two built-in drawers my grandfather made to her specifications. Long ago, the top one was filled with white flour poured directly from the sack she bought from the Best Out West mill in town. The bottom was filled to the brim with white sugar. A battered tin cup was half buried in the middle of the white mound. These two drawers, when she dictated what was put where, were uncluttered and pure. Now that I’ve moved into her kitchen, I was careful not to break the tradition of flour in the top and sugar in the bottom, but with major variations. In the top, no white flour. Instead tins of whole-wheat pastry flour, brown rice flour, spelt, rye, buckwheat, quinoa and a bag of kamut elbow for room in the deep drawer. In the bottom drawer, there’s no white sugar. Containers of raw sugar and date sugar fit securely in the corners while jars of rice syrup, unfiltered, locally grown honey, and agave nectar from the tequila plant leave sticky rings on shelf paper since the 60’s. “Well, good luck with that,” she says, turning to go. “Wait, Grandma,” I say, reaching out and touching her muscular forearm. The sensation surprises us both. My mother’s family was not demonstrative. I don’t recall my grandmother ever touching or hugging me, but surely she did, didn’t she? The other day I came across a photo of the two of us. I’m standing in eight-year-old awkwardness in front of her, my hands placed stiffly on my thighs. The difference in how tall the spruce trees behind us have grown marks the years between. Our hair is almost the same, aged silver and innocent blond, falling to our shoulders in soft curls. I’ve looked at this photo many times, but what I never noticed until now is that my grandmother isn’t touching me. It would have been so natural for her to rest her hands on my shoulders since I was standing so close. Instead, her arms are clamped resolutely to her sides. “And I’m good at gardening and growing flowers too, just like you,” I say, looking for approval 42 years after she can no longer give it. She looks toward the table where her old glass flower vase can barely hold the vibrant colors of spring tulips and yellow daffodils. Her gaze continues around the knotty pine walls, noticing what changes I’ve made to make it my own. My collection of blue antique jars filled with grains, seeds and beans are stacked in righteous rows on a shelving unit I found in the garage. I’m curious if she notices which jar is hers – the one I found discarded in the basement as if worthless. She lingers longer on the photo of an 18-year-old Reta, newly married to Malcolm, framed in ornate chrome salvaged from an antique cook stove. “Was I ever that young?” she says so quietly I barely hear her over the raging of the creek – a creek raging against growing old in this house, and for the growing seed of dementia that tangled her thoughts the last years of her life. I make myself recall her in better times. “I remember watching your hands work as if on automatic pilot making the cinnamon rolls I had requested and looking out at that creek.” We both look out the kitchen window at the only thing that has not changed drastically in the intervening fifty years. “I know you will, Janey,” she says quietly. I smile. Calling me by my middle name instead of my first was her term of endearment for me even though I didn’t realize it until years later. It is as personal as my grandmother ever got with me, this secret between us, until I took it for my real name in the 6th grade. She looks down at the forgotten piecrust. “Start over.” A firm demand but the right choice. She won’t let me subject my husband to this glop even though he bravely eats whatever I cook and doesn’t complain. I scrape it up with effort and plop it into the compost can. I doubt if the deer will even eat it. I start over, but lard is out of the question and I can’t bring myself to use shortening, but maybe I can splurge this once and use butter. “How about butter?” I ask, turning around. I set to work. As if Grandma is guiding my hands, they move swiftly and with confidence measuring the flour and salt, using the pastry blender to mix the butter, and dribbling in the ice water. In no time, the dough is not too wet, not too dry, but just right. A miracle. I pick up her wooden rolling pin. “I think I can do this,” I whisper. I feel a soft touch on my shoulder, reassuring. I smile and the creek laughs. I go turn up the stereo until the harmony of the Eagles rocks the walls, breaking old traditions and setting a new precedence. I dance my way across the small kitchen floor where my grandparents once waltzed and my parents sashayed a two-step. I feel the aging floor creak and shift as the old gives way to the new. I step into the treasured spot, claiming my rightful place with no apologies, but with great reverence and gratitude. This is the end of the article entitled Spirit in the Kitchen published by Tupelo Kenyon on September 3, 2010 at 5:00 am | In Diet and Nutrition, Health and Fitness, Inner Guidance, Passion, Relationships, Self-Image - Copyright 2007 - All rights reserved worldwide. 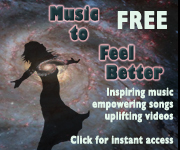 For more info about "Music to Feel Better" click here. The Inspired on Purpose Association is good to share. Get info on FREE 30-day trial for friends & family. Why wait for inspiration to strike? Be proactive, and allow it to come to you. This newsletter brings it directly to your inbox. "Inspired on Purpose" newsletter by Tupelo Kenyon contains articles, reviews and resources to supercharge your personal development, inspiration, productivity, abundance and joy. Get it now below, or get full details on Home Page. If you liked this article, please let others know about it at the social bookmarking site(s) of your choice . . .
Watch Tupelo's short video about his FREE "Inspired on Purpose" newsletter and 7 FREE gifts. Check out Tupelo's music CDs. PRESS RELEASE - It's news! empower all areas of life . . . There are lots of articles here . . .
enough to fill a few books! For all titles, see the ARCHIVES. Ego or Soul? Who’s Driving? Goal Setting or . . .
Work– Just a Job or Visible Love? Host a Laughing Bird Concert.